Major Painting in the College of Fine and Applied Arts. Minor: English. Also Pre-Law. Why did you go natural? I decided to go natural because I want more volume and desire to have my hair in a healthier state. 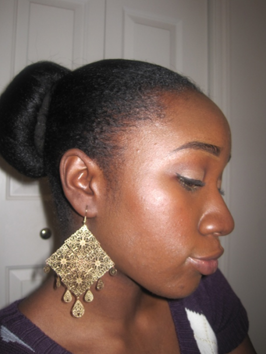 What is your favorite attribute of your natural hair? 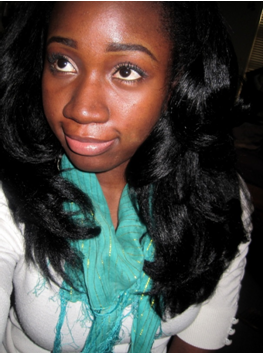 I love the fact that I can wear it curly and I can also wear it straight by simply using a flat-iron. What have been people’s reactions to your hair? So far, I have not had any negative reactions, because I have not been transitioning for that long. How would you describe the natural hair movement on UIUC and in the general population? Is there even a natural hair movement to speak of? I believe that there is a natural hair movement. This natural hair movement has created some controversy as to why women want to go natural, but overall I see it as a positive attribute to UIUC, because I have realized a lot of women further embracing themselves through natural hair. Fun random fact about yourself! I speak 3.5 languages (Twi, Ga, English, and a little bit of French. 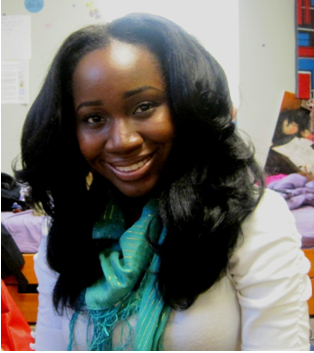 This entry was posted in Meet a SuperNatural, Transitioning and tagged protective style, transitioning, weave. Bookmark the permalink.